We planted three apple trees this past spring, and while they appear to be doing great, they also seem to have “inherited” the fungus that all of the maple trees have. I haven’t done any testing to determine what it is specifically. I just know it’s fungal and it looks like yuck. My hunch is that it’s a rust disease but I don’t know if rust diseases are common for maples, and they look the same. But I digress… I don’t believe it will kill the trees, but since the apple trees are still new, it may be a little harder for them to adapt. Fungal problems, regardless of the type of fungus, all have the same cycle. Infection leads to the development of secondary fungal spores. 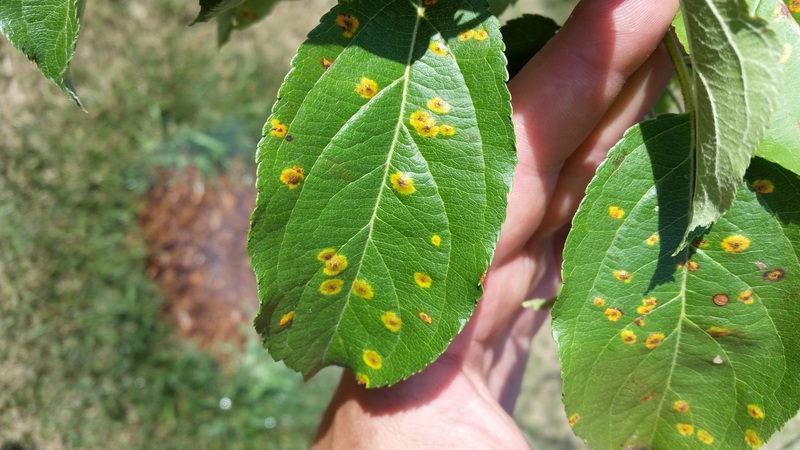 Secondary fungal spores lead to leaf or fruit infection. Leaf or fruit infection leads to the diseased leaf or fruit falling to the ground. Once on the ground, the fungus overwinters in the fallen debris. In the spring, primary spores are released which causes re-infection of the tree. And then it starts all over again. One important way of controlling fungal problems is with proper hygiene, and I’m not talking about showering and brushing your teeth. If you have any type of fungal problem with your trees, ornamental or edible, you must clean up and destroy fallen fruit and leaves. Now. It’s fall, after all. Good garden hygiene helps eliminate fungal and pest problems whether we’re talking about trees, flowers or vegetables. Don’t just toss the leaves and diseased debris in the compost pile either because that’s just a nice, warm winter home. Burn those suckers and break the cycle (or bag them if you must). We have a really large property so bagging and burning all the fallen leaves is a pretty huge task. Even with the new lawn sweeper that Jeff got this year, it may not be easy to control. So, I was pretty happy when I received an email from a PR company telling me about some exciting new products. 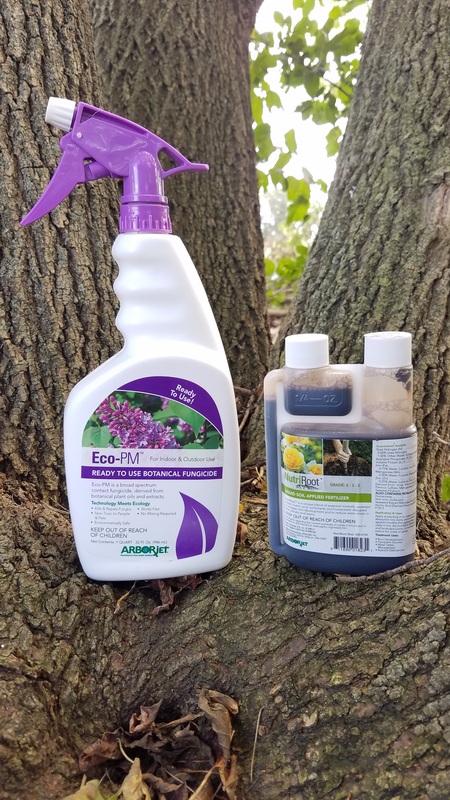 Eco-PM, from Arborjet, is made from high quality botanical plant oils and extracts for naturally protected plants, these products are safe for use on food crops like my apple trees and the fruit can actually be harvested the same day that the tree is treated. Eco-Mite Plus works on contact against mites, aphids, mealybugs and more. Eco-PM controls powdery mildew, rust, black spot and other diseases. The sample I was sent was for Eco-PM. This is going to be a huge help in breaking the fungal cycle on our property this spring. I probably would have been content with keeping the leaves cleaned up if it was just the ornamental trees affected, but with new apple trees, I want them to have the best chance possible. And y’all know I don’t want chemicals any where near something I plan to eat. I was also thrilled to get a sample of NutriRoot. What’s cool about NutriRoot is that it’s the only water management + fertilizer system available on the market today. Designed to increase root development, and reduce water stress and transplant shock in your trees, shrubs, and lawn, NutriRoot pulls water out of the air and condenses it back into liquid form. This helps to reduce watering and keep the soil moist so when you do water, it’s more easily absorbed. Oh how I wish I had this stuff when we first put the trees in! Seriously. The hoses don’t reach out there y’all. So I was hauling buckets out to those trees. Every. Single. Day. Thankfully Jeff eventually got a couple more hoses, so now it’s a much easier job, but geez. Anyhow, NutriRoot is a blend of nutrients, seaweed extract, humic acid, surfactants, and humectants, so that combination feeds the trees while improving moisture. The directions say to use it in the fall right after leaf drop (since I didn’t have this product when the trees weer planted) or in the early spring. It isn’t quite the time for leaf drop here, but it will be soon. I’m excited to see how well this stuff helps nourish our trees. So, guess who’s going to have nice, healthy little apple trees now? And I’m super excited to see how they do next spring because we actually already had a couple of little apples this year. Next I want to plant pears. And maybe grapes. And of course, more herbs… Oh boy. Garden season is about done here in Wisconsin and I’m already planning for next year. Fortunately, Arborjet has a nice line of products to help me out. Check out the website. And look for an update post here in the spring (please, someone remind me…). How did your apple trees do this year?